The leadership of ordinary Christians in our worship is valuable and important at Oak Harbor Lutheran Church. It is a reminder that we are all disciples of Jesus Christ and ministers of the Gospel. Assisting Ministers lead the congregation in prayer, read scripture lessons, and assist in serving Holy Communion. Cantors are vocalists who sing various parts of the liturgy. 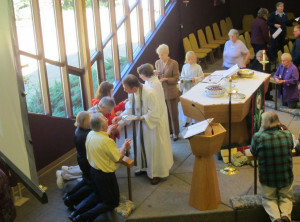 Acolytes light and extinguish the candles, help collect the offering, and help serve communion. Acolytes are usually young people. Anyone tall enough to reach the candles and mature enough to handle the job is welcome to serve in this way. Training for all of these ministries is offered regularly.